How Did We Get So Far Off Track? I started working in the digital world in the mid-’90s. While I wasn’t exactly there for the dawn of the digital age, I was a relatively early member of the group of executives that began building businesses on the internet and on walled gardens like AOL used to be. A couple of things that have happened recently have me shaking my head, wondering how it’s all gone sideways. Keith Ritter, your advertiser list is ready! The list attached includes the advertisers that have included you in a tailored audience. These advertisers have included you in one or more tailored audiences. Tailored audiences are often built from email lists or browsing behaviors. They help advertisers reach prospective customers or people who have already expressed interest in their business. I figured since I do a fair amount of cookie-blocking and other means to prevent tracking that I’d turn up in a handful of audiences and I was right. I appear in exactly 9 audiences. However, the rest of the 57-page document (not a typo) listed the similar audiences Twitter has decided I fit. They market me as a part of these audiences and I have no control over it. I can opt out and it will change the ads I see on Twitter. It won’t however, remove me from these audiences. I am included in over 1,000 of them, my data used and sold quite unwillingly. It’s taken years for the marketers and publishers to push back on the rampant fraud and abuse of programmatic ads. Social media is rife with “influencers” who buy fake followers and regularly violate FTC regulations on advertising. It seems that everyone under 30 is either a ninja or a guru. Fake reviews for products that are complete rip-offs are everywhere (run a link to an Amazon review through Fakespot if you don’t believe me). All of this leaves one question: what the hell happened? How did the digital business world get so screwed up? At some point, Facebook and many other digital businesses decided that making money is way more important than serving their users is, I think, the basic answer. I’m all for making money, as my business track record shows. There are limits, however, and I have a fundamental belief that making money can only happen over the long term when you respect the customer. As the great David Ogilvy once said, “The customer is not a moron. She’s your wife.” Because most of the people who use digital have no concept about how they are tracked and marketed, most businesses treat them as morons and therein lies the problem. I could rant on but I’ll end it here with a plea. To any of you who are in the digital world, please resolve to get back on track. Way back when in 1995, all we wanted to do was to amuse a few people and keep them engaged. Yes, we sold ads but we also didn’t track people once they left our domain. We didn’t treat them as numbers or rubes. You shouldn’t either. I get that the tools are more sophisticated and more powerful and that the world has changed. Basic business principles and human decency haven’t, have they? The obvious question is what can we learn, both about what’s going on in the food world as well as what we can take away from our own businesses, from this list. Here are a few observations from me. First, half of the searches were related to “keto.” For those of you somehow unaware, keto refers to a ketogenic diet. That’s a very low-carb diet, which can help you burn fat more effectively. Many people have already experienced its many proven benefits for weight loss, health, and performance. It’s not without problems but clearly, it’s gone front and center with a lot of people this year. I try to follow a modified keto diet myself, limiting carbs and trying to eat only low-glycemic foods. What can that tell us that might help our business? If you’re in the food business it’s pretty obvious, but even if you’re not it demonstrates that consumers are paying a lot more attention to their health and their diets. Movie theaters, airlines, and other transportation companies sell food. Your company or your building may have a cafeteria that does the same. Understanding that consumer eating habits are changing is critical to maintaining those bottom lines. “CBD Gummies” point to the changing way we’re looking at weed. These are gummies made with cannabidiol, just one of the hundreds of compounds hiding within the cannabis plant. Some have no THC, others very much do. The point I want to make is that the weed business is exploding, so much so that tobacco and drug companies are trying to figure out how they can become involved. Is CBD a fad? Maybe, but once again, we can’t ignore trends in the marketplace and we need to think through if there is an opportunity or how our business might be impacted. The “Romaine” search term clearly derives from the e-coli scares with that green this year. A great reminder that we all need disaster plans in place. If you’re not familiar with it, “Gochujang” is a red chile paste that also contains glutinous rice, fermented soybeans, salt, and sometimes sweeteners. It’s a thick, sticky condiment that’s spicy and very concentrated and pungent in flavor. Another reminder that not only are tastes changing but as our population base is changing, our eating, media, shopping, and other habits are changing as well. We need to pay attention. Finally, “unicorn cakes” are just silly. They’re multi-colored layer cakes generally covered in a highly-decorated white icing. They’re a great reminder that we all need to take a little time to have fun and enjoy ourselves by indulging in something that’s totally unrelated to our work lives. Those are the insights I take away from the list. What are yours? Verizon Communications Inc. is conceding defeat on its crusade to turn a patchwork of dot-com-era businesses into a thriving online operation. The wireless carrier slashed the value of its AOL and Yahoo acquisitions by $4.6 billion, an acknowledgment that tough competition for digital advertising is leading to shortfalls in revenue and profit. The move will erase almost half the value of the division it had been calling Oath, which houses AOL, Yahoo and other businesses like the Huffington Post. For you non-financial types out there, writing down an asset is the accounting term used to describe a reduction in the book value of an asset due to economic or fundamental changes in the asset. In other words, something isn’t worth what you paid for it any longer. Oops. These were acquisitions that Verizon made to transition into taking on Facebook and Google as a content providing, eyeball-generating ad brand. This latest stumble comes on the heels of several others that Verizon has made over the last several years (a JV with Redbox, their failed news site, their awful app store and of course, V-Cast). When you basically spend $4.8 Billion and flush $4.6 Billion of it down the write-down toilet as they did the other day, you might need to rethink your strategic direction. When you think about it, what Verizon did is not all that uncommon in business. They forget what their core competencies were and chased the latest shiny object. Big mistake. Where would we be now if all that capital had been invested in 5G networking or in WiMax? Video and advertising is something in which hundreds of companies are engaged. Yes, it’s highly profitable but it’s also dominated by two behemoths and subject to the ebbs and flows of consumer interest (whatever happened to MySpace anyway?). Why would you try to keep up with those Joneses? It seems as if FiOS, their high-speed broadband service has been abandoned. They’re no longer expanding despite the fact that demand for very high-speed internet is everywhere. 5G is years away and technically challenging. Does anyone remember the dream of WiMax? Those are areas in which they are the Joneses and people have to keep up with them. None of us in business can forget what made our ventures successful because we think the grass is greener in some other business’ yard. Don’t chase the Jones’ success. Create your own. Yesterday was Veteran’s Day. I don’t typically post on Sundays but I did want to honor all of those who served by putting out something, even if a day late. This is my post from 2009 (yes, I’ve been at this for quite a while) and I like it as much now as I did then. 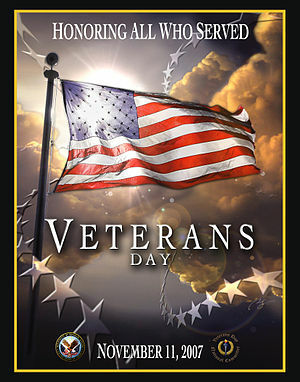 Thank you for your service if you served and please remember to thank a vet, even if it’s a day late. Today is Veteran’s Day, a holiday which was created to commemorate the end of “The War To End All Wars.” While that part didn’t work out so well, it’s a worthy celebration of our men and women who have served and are serving in the Armed Forces. My Dad is one of those vets. He fought – as Archie Bunker used to say – in The Big One – WW2. And while he’s taught me a lot over the years, he and his fellow vets teach us another really valuable business lesson to go along with all the others. My father got out of high school and went into the service like most of the young men (and many young women) of his generation. They put their country ahead of themselves realizing that the answer to “what’s in it for me” lay in the preservation of the principles on which this country was founded and which made everything else in their lives possible. The really inelegant analogy I want to make has to do with how we approach business. While the stakes in business aren’t nearly what they were and are for the vets, there are still people making that same decision today both in and out of business. That decision is to put something else – your customers in the case of business, your country in the case of vets – ahead of yourself. I’ve written a lot about everything from lousy customer service to marketing messages that shout “me me me” and not “you you you.” That’s so 1999, isn’t it? Converse, don’t spew. Listen, don’t talk. If I can’t get you to engage in a conversation and put others first because it’s smart, how about to salute the vets? Sad news about Sears today. An American institution, they filed for bankruptcy in order to restructure the company. They will close 142 unprofitable stores near the end of the year. Liquidation sales at these stores are expected to begin shortly. This is in addition to the previously announced closure of 46 unprofitable stores that is expected to be completed by next month. The press release says that “The Chapter 11 process will give Holdings the flexibility to strengthen its balance sheet, enabling the Company to accelerate its strategic transformation, continue right-sizing its operating model, and return to profitability.” I guess the question I’d ask is what the heck has taken so long? When I was a kid, the Sears catalog was a 500-page wish book. Everything from clothing to tools to appliances and damn near anything else was in the catalog or the store. At one point you could even buy a prefabricated house kit. They sold great appliances (built by Whirlpool) and even better tools (also built by others). They did very smart things like label grades of product “good” “better” and “best” using brand names. They were Amazon long before Amazon was a gleam in Jeff Bezos’ eye. So what happened? Well, technology did but that’s only part of the story. This is a perfect example of what can happen when any of us fail to recognize the fundamental changes happening in business – all business. Obviously, online commerce happened but Sears was in decline in the early 1990’s as Walmart took over the title of largest US retailer. Then the little wave became a tsunami, as consumers fundamentally changed their behavior, becoming more price sensitive, doing more research and shopping online, and the shift away from the mall sped up. You might not remember this, but Sears was an investor in Prodigy, one of the original online services. They jumped out of the digital service in 1996, however. One can only wonder what might have been had they stuck with it and learned from it. Even though walled-garden services died as the internet grew, there was a lot to learn. Remember that Amazon didn’t begin to sell beyond books until around 2000. Why did they bail? To get back to what they knew best – retail (they also sold off their interest in brokerages and real estate companies they owned). It would be easy to read this story as a triumph of e-commerce, or to reflect on the irony that Sears was a first-mover when it came to online shopping, with its proto-internet joint venture Prodigy. But even recently, Sears has been ahead of the curve in that area. According to Bloomberg, Lampert “showered” the online division with resources while the rest meleed over a shrinking pie. Nor did competition with Amazon alone precipitate Sears’ decline. When sales and profits began to fade, in the mid-2000s, other big box retailers—particularly Walmart—were thriving. In 2011, the year Sears lost over $3.1 billion, Walmart made $17.1 billion. This is a story of a series of failures. It’s also a cautionary tale to any of us who live and work in these changing times. Brick and mortar stores still make up the vast majority of retail sales in this country yet the country’s largest retailers failed. Greed? Ignorance? Stupidity? What are your thoughts? This Foodie Friday sees the opening of the North Carolina State Fair. Until I moved here, I had no idea that state fairs were such a big deal. I mean, I knew that we had them up north, but they always seemed to take place in some remote part of the state and I don’t recall ever having attended one. That changed when I headed south. This fair is a big deal and it’s right here in the middle of the state. Last year, over a million people attended and the day I went, it was jammed. While some of the folks there are interested in the giant vegetables on display or the prize hogs being shown, many more are there for the food, and that’s our topic today. The NC fair seems to be a coming out party for many foods that I can only classify as lab experiments. Many of the foods for sale are normal things such as Cuban Sandwiches that have been “enhanced” by deep frying. Deep-fried Key Lime Pie? You bet! Others are the sorts of things one might dream up in college while in altered states of consciousness. Unicorn Bacon, which is Bacon-on-a-Stick dipped in glaze and rolled in Fruity Pebbles cereal. Then there’s Jalapeno Cheetos Bacon: Bacon-on-a-Stick dipped in jalapeno nacho cheese and rolled in Cheetos. You catch my drift. Here’s my issue. We have an obesity problem in this country along with an epidemic of diabetes. I don’t think people would have a heck of a lot of fun eating salads as they stroll the midway, but there’s also no limit on how much of the nutritionally horrible stuff one can consume. Before you jump on me, let me point out there the fair does limit how much beer or wine you can buy. In fact, they only started selling beer and wine last year, and you can buy 6oz of wine OR 16oz of beer or cider. Period. One time only, and it’s sold in only one place. In part, it’s to maintain a family-friendly atmosphere but it’s also because the powers that be think alcohol isn’t good for you. Is limiting unhealthy food consumption that different? There’s a lot of education at the fair. There are demonstrations and exhibits of just about everything represented there. There isn’t, however, any education about healthy eating nor about what a burger held between two Krispy Kreme donuts does to your system when it’s consumed after Candied Bacon S’mores and a Shrimp and Cheddar Cheese Grits Eggroll (that sounds pretty good, by the way). Throw in a sugary soda or two and it’s pretty easy to see why there’s an obesity issue. I know people don’t eat this way all the time and every so often, it’s fun to treat yourself. The problem is that many folks really do eat this way much of the time. None of us in business can afford to kill our customers. In this case, educating the customers about what they’re putting in their bodies might help keep a few of them around a little longer so they can indulge for many years to come. Do I think the vendors are being malicious or deceptive about what they’re selling? Not a bit. I just wish they, like all of us in business, thought about what impact their products have on their customers and the environment before they pushed them on the public. The rides at the fair have signs explaining that some people shouldn’t ride and that the ride is a health risk to others with back conditions, high blood pressure, etc. Maybe the food stalls need something similar? It’s Yom Kippur, the holiest day of the Jewish year. This was a post from several years ago. As I read it over, looking for inspiration for something to write on the subject of change and business based on the holiday, I realized that I had expressed my thinking pretty well in the earlier post. Those of you who celebrate the holiday are probably not reading this until sundown (I scheduled this yesterday in keeping with the spirit of not working on the day). Whether you do or don’t celebrate, I hope you’ll take a moment to reflect. Yesterday was Yom Kippur, the holiest day of the Jewish year. For those of you unfamiliar with the holiday, it concludes the 10 day period at the start of the Jewish calendar – Rosh Hashanah – head of the year – during which all Jews are supposed to reflect upon the past year and examine how they’re going to change their lives going forward. One also seeks forgiveness from those against whom he has transgressed – both those of this earth and higher powers. There is a lot of other imagery connected with the period – inscription in the Book of Life being a big one – but I think there’s something each of us can take as a business lesson in a non-denominational way. We all get off track. Sometimes it’s in little ways like eating badly or drinking too much. Sometimes it’s in big ways like alienating our families or hurting friends who love us. The concept in Judaism of repentance is called Teshuva which means “return”. I love the notion of coming back to one’s self as well as to the basic human tenets that are common to all religions and peoples. We can take a period of reflection and “return” in our business lives as well. The most obvious way is for us as individuals. Who have we alienated this year? What client have we taken for granted? But it a bigger opportunity. How has the business diverged from the mission? Why have we stopped getting better and are just marching in place? What can we be doing to grow our people but are ignoring? We ask those kinds of questions from time to time, but I guess I’m suggesting that it become a more formal process. Set aside a period every year for “return” thinking. A period of repentance? Maybe, in some cases. But in all cases a chance to change. A chance to regret past bad actions and to vow not to repeat them. Most importantly (this is true in the religious sense as well), to correct the transgression. To apologize. To make restitution. Whatever is right and lets everyone move forward with a clear conscious and a vow to do better.